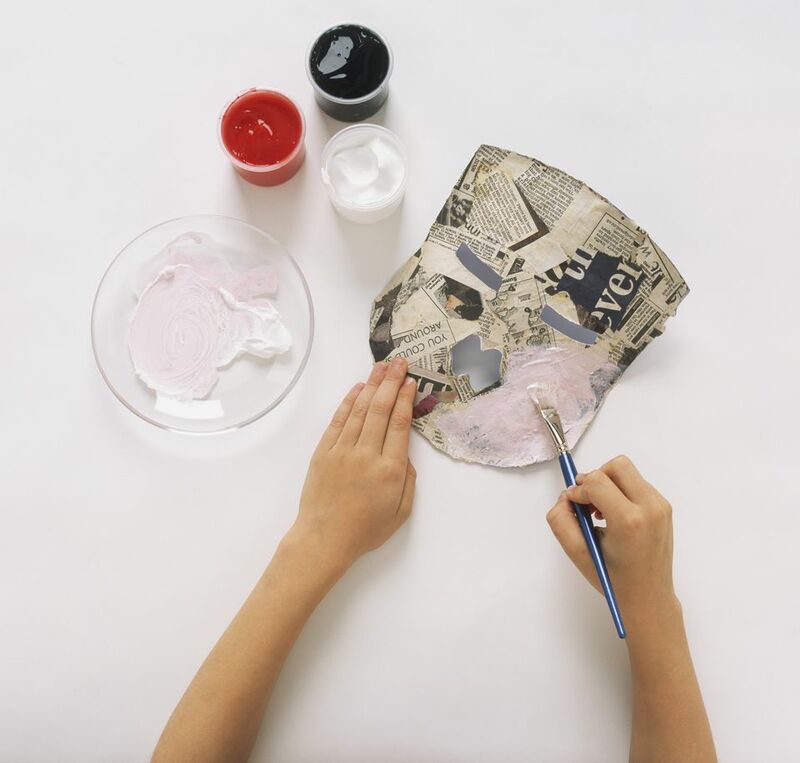 Why not help your child make a mask using their own face as a mold. You can also make a mask using a balloon as a base. Not only can this be a fun and educational craft, but it is also a great way to make decorations and accessories for Halloween. Make sure you cover your work surface well. This can be newspaper laid on top of wax paper, freezer paper, or even on an old tablecloth or shower curtain. To allow ample drying time, you will need a few days to complete this project. To make a mask using a face as a mold, start off by tearing off a piece of aluminum foil at least twice as long as the subject's face, fold it in half. Use the subject's face as a mold by gently pressing the double layer of tin foil over it. Wad up the newspaper and place it inside the curved section of the foil mold and lay it on your work surface. If you prefer to use a balloon as a mold for your mask, start out by blowing up a balloon and tying it closed. Find a bowl or cup your balloon can sit on while you work on it. Completely cover the cup or bowl with plastic wrap so the paper mache hopefully does not stick to it. Tear newspaper into strips about 1- or 2-inches wide and 4- to 8-inches long. You will need a lot of newspaper. Choose a paper mache recipes and make it. Follow step-by-step directions to cover your foil mold or balloon. If you are working with a foil mold, make sure not to press too hard or it may lose its shape! Cover the foil mold with at least 3 or 4 layers of paper mache, letting it dry completely between layers. If you are working with a balloon, you will only want to cover half of the balloon with paper mache unless you want to make an entire head. Once you have on one layer of paper mache and it is dry, use various supplies to make dimensional facial features on your balloon. You can make a nose, ears, thick eyebrows, lips, etc. Use cardboard, newspaper, foil, or other items. Use masking tape to hold everything in place. ﻿Once you have created all the facial features on your balloon mask, continue to add 3 or 4 more layers of paper mache. Once the paper mache is dry, the mask can be painted and decorated however you like. If you used a balloon base, pop the balloon and remove any loose pieces. If you can't get them all, don't worry no one should see them on the inside. You can use a variety of craft supplies to add some personal touches to your masks, such as yarn, fabric scraps, beads, glitter, and paper. You are only limited by your own imagination. While this mask is more for decorative purposes you can cut eye holes out before you decorate it and also punch holes on either side to add ribbon or elastic to fit around your head.